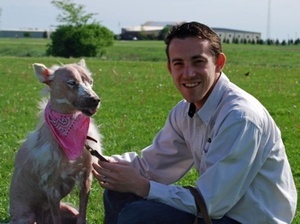 Dogtime salutes Ohio’s Union County Humane Society. The Union County Humane Society was originally founded in 1913 by a group of community leaders who were dedicated to protecting and ensuring the humane treatment of animals and children in Union County, Ohio. It was not until 1999 that our current shelter was built in Marysville through donations and support from the public. UCHS is a private nonprofit humane society that also serves as the local animal shelter and cares for all of the animals brought in by the dog warden. Our mission is to connect people with animals and enrich lives. We accomplish our mission by successfully placing 90% of the 1,300 animals in our care, and by offering innovative programs to the public such as the Ruff Reading Program where children increase their literacy rates by reading to our shelter animals, and the Heel2Heal program where shelter dogs live at a local youth detention center being trained to become Canine Good Citizens. Most of our animals come in as strays, at least 70% of them. Each year we care for approximately 1,300 dogs, cats and other domestic animals and it is a combination of people finding strays in their neighborhood or the dog warden bringing in strays off the streets. The first thing that happens is your standard intake, where we search for tags or scan for microchips as well as vaccinate the animals and prepare a clean place for them to stay. As the only humane society and the only animal shelter we cannot turn away dogs brought in by the Dog Warden, so even if we are full we have to figure something out, whether it be a temporary cage set up in the bathroom or transferring one of our longer residents into a foster home. All dogs are held for 72 hours while we try to relocate the owner, or 14 days if we have their contact information and cannot reach them. After that point the animals are assessed and placed up for adoption. We never euthanize based on time or space, and will spend as long as needed exploring all available options to find homes for our adoptable animals. 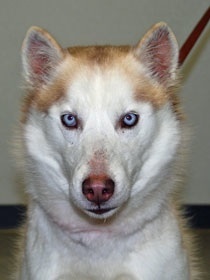 Angie first came to us late 2008 as a stray, a beautiful Husky with a white coat and piercing blue eyes. She was heartworm positive, which we treated, but other than that healthy and happy. After about a month she was adopted to a new owner, a returning veteran from Iraq. Unfortunately this new owner received marching orders shortly after coming home, and had to send Angie to his mother’s house. Sometime between February and April 2009, Angie was re-treated for heartworm (we are not sure why to this date) and shortly after that she became very lethargic, stopped eating and her hair began to fall out in clumps everywhere. The owner’s mother did not know what to do and couldn’t care for her, so the owner had a friend drop Angie off back at the shelter. Before the friend could get Angie out of the car, she bolted. Later that night I received a phone call from the police about a “mangy looking” dog roaming a parking lot near the Humane Society so I went out to help. As I approached the parking lot the floodlights shined down on a medium sized dog that was going bald in very large patches, with what looked almost like a chemical burn on the bare skin left behind. I looked and I looked, and after a few minutes I realized that this was our Angie that we knew was supposed to come back earlier in the day. I tossed a few treats at her, and she quickly came up and planted a huge kiss on my face. Since it was a nice spring night (and I didn’t know what she had) we walked back to the shelter instead of driving. In the morning Angie looked even worse. As she slept the rest of her hair fell off, and except for her tail she was completely bald. Her skin was hot and red and very painful looking, and she seemed to be suffering. Our vet gave her some medicine to ease the pain and relax her while we discussed Angie’s options. We are not a no-kill shelter as we lack the resources to do it properly, and we only euthanize based on aggression or a severe medical problem which is causing the animal to suffer…which is what Angie had at the time. She is so sweet and loving though, that we decided to sent a skin biopsy to Ohio State University and keep her comfortable until the results came back. We quickly learned that Angie has a condition known as telogen effluvium, which is relatively rare and does not cause any problems until the animal is stressed out or receives too much medication. The side effect is massive hair loss throughout the body. We now knew that Angie was going to be okay in time, so we kept her until she found a new home. Spring turned into summer and Angie was adopted, only to be returned the next day for reasons unknown. A month later she was adopted again, only to be returned in three days because the apartment manager did not like her. After her fourth time returning to the shelter, Angie began to change. She became depressed and moped around, and again we wondered if we were doing the right thing. No Husky rescue group that we worked with had room to take her, and she received few serious looks. Finally, a gentleman that works at the local women’s reformatory came by to look at Angie, and after a few visits with his family and children decided Angie was the right dog for them. In December, with her hair still growing back, Angie was finally adopted into her forever home, a 13-month saga for this beautiful Siberian Husky with a heart of gold. 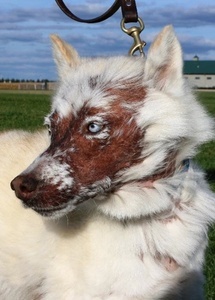 We keep in touch with her and her new owners, and last week we heard that everyone is doing just fine and her coat looks beautiful!